It was a lazy Sunday morning, and after getting up bit late from my bed and I got stuck like what to do now for breakfast. Searched my refrigerator for the clues and found these left over bread slices and a small bowl of dosa batter lying idle. This reminded me of a recipe I bookmarked a weeks ago. Picked both of them and started with this masaledar recipe and within minutes found my family enjoying this for the breakfast. 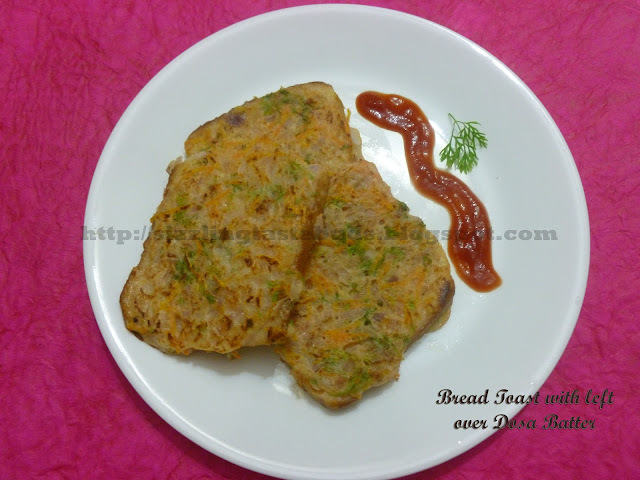 Here's the recipe for a quick Bread Toast with left over Dosa Batter. 1. Add some water to your dosa batter if its too thick. 2. Add finely chopped onions, chopped coriander leaves, red chilli powder or green chillies, grated carrot, jeera powder and salt to taste. Mix well. 3. Dip the bread slices in dosa batter and place it on a greased( with butter or oil) tava. Pour some batter with a spoon on top of the bread slices if needed. 4. After 1-2 mins, flip the bread slices and cook on a slow- medium flame till you get a nice crisp layer on the slices. 5. Enjoy with Tomato ketchup or coconut chutney.